The Osprey is the publication of Nature Newfoundland and Labrador (formerly the Newfoundland and Labrador Natural History Society). These days, more and more articles are posted to our blog instead, but The Osprey’s three decades of history have made it a very valuable resource on wildlife in this province. It provides a forum for discussion of environmental issues and is a source of information and original research material focusing on Newfoundland and Labrador’s natural history such as birds, plants, insects, mammals, general ecology, and philosophical nature musings. All Nature NL members can access The Osprey under Issues – become a member here. Archived issues can be found through the MUN library. 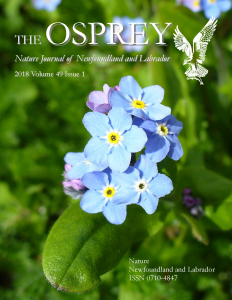 If you would like to write for Nature NL, articles can be sent to osprey@naturenl.ca. 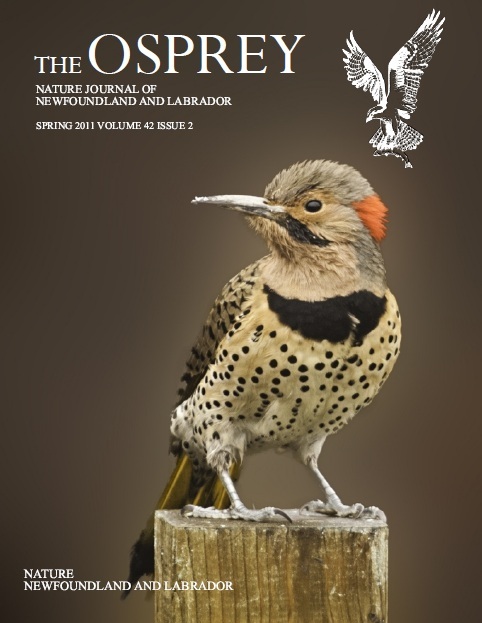 Articles can be submitted by anyone, such as students, professional field biologists, university faculty, amateur naturalists, nature writers and nature observers. This can include rare sightings, trip reports, issues, projects, and perspectives. Illustrations or photos are welcome. Submissions will be reviewed by the editors and those deemed appropriate will be published. The Osprey does not generally accept anonymous submissions, advertising or solicitations. Views expressed in Letters to the Editor are not necessarily the views of the editor or Nature NL. The Osprey is a source of information on various aspects of the province’s natural history such as birds, plants, insects, mammals, general ecology and philosophical nature musings. Some articles are available below, but Nature NL members can access the complete The Osprey here. Can the George River caribou survive with continued hunting, threats to habitat, and food shortages? A trip report on our annual Winter Gull Workshop at Quidi Vidi Lake. An up close look at four species of forget-me-nots on the island. Interview with local nature artist Brandy Barry. Activities and goings-on of the Humber Natural History Society. An updated distribution and feeding habits of American toads in Western Newfoundland. Summary on the successes and lessons learned from our Nature NL’s project connecting new immigrants and nature.